Delivering award-winning journalism and the most sought-after demographics in all of publishing for nearly 40 years. Outside Online is the top digital destination for active participation in the world outside. Interact daily with our 1.5+ million followers to increase awareness of your brand and create meaningful dialogue. Reach a highly dedicated, always-on audience to drive high brand recall and sales. Outside TV is the only national network dedicated to the active adventure lifestyle. 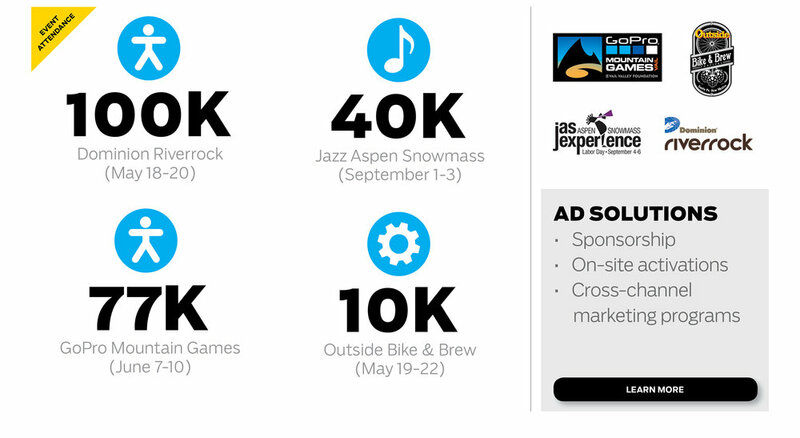 We offer a variety of active lifestyle events to further engage our audience with your brand.